Exposed skin reflects light and may draw the enemy's attention. Even very dark skin, because of its natural oil, will reflect light. 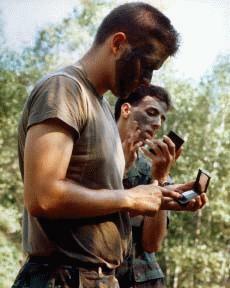 Camouflage face paint is used to camouflage the skin. When applying camouflage stick, soldiers work with a buddy in pairs to help each other. A two-color combination of camouflage stick is applied in an irregular pattern. Shiny areas (forehead, cheekbones, nose, ears, and chin) are painted with a dark color, and shadow areas (around the eyes, under the nose, and under the chin) are painted with a light color. In addition to the face, exposed skin on the back of the neck, arms, and hands are also painted. Palms of hands are not normally camouflaged if arm-and-hand signals are to be used. The three standard camouflage face paint sticks are: loam and light green for all troops in areas with green vegetation; sand and light green for all troops in areas lacking green vegetation; and loam and white for all troops in snow covered terrain. 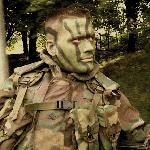 All camouflage face paints have been designed not only to provide the desired camouflage protection, but also must meet soldier acceptability and safety criteria. Design criteria includes comfort in application and wearing, durability over time, appearance, resistance to perspiration, ease of application and removal, and compatibility to clothing and other equipment. The face paint will not reduce the natural sensing capabilities of the soldier, and is nearly odorless, and it will not cause any health hazards such as skin irritation or due to possible ingestion of material. Logistic concerns such as capability of being used and stored in all climatic conditions without degrading, expendable item with no environmental hazard due to the disposal, and is designed such that it can be carried in the pockets of standard combat clothing. Camouflage face paints in any form fall under the classification of a medical item due to the application to skin. Responsibility for the item therefor belongs to the U.S. Army Medical Research and Materiel Command (AMEDD) at Fort Dietrick, Maryland. 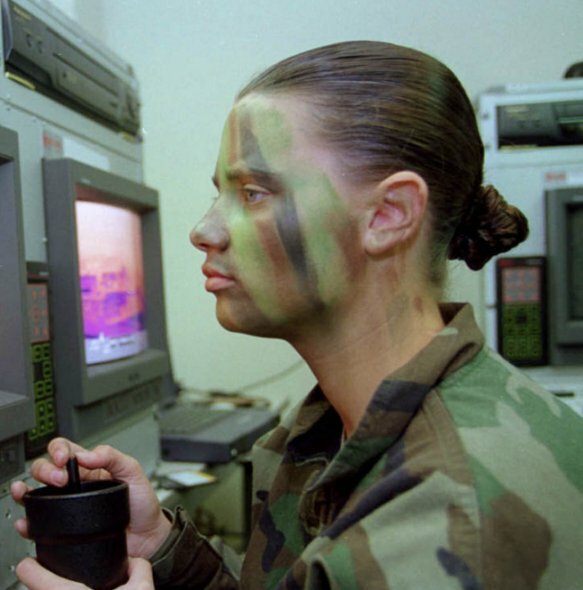 A long relationship has existed between AMEDD and the US Army Natick Research Development and Engineering Center (NRDEC) in the development of camouflage face paints. NRDEC's expertise in camouflage for the soldier and other soldier equipment has long reinforced the relationship as the developer of face paint items. Current camouflage face paints in compact form provide passive camouflage protection in the visible and near infrared regions of the electromagnetic spectrum. The camouflage face paint is used on all exposed skin to provide non-glossy colors and to tone down highlights and skin shine minimizing contrast to various backgrounds. The compact is suitable for all climatic categories from Arctic to Desert, where face paint camouflage is required. 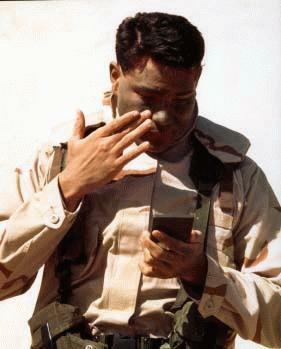 It is used by active duty military personnel in field units and will not present any physical hazards to the soldier. The compact is a olive green cosmetic-like container with an acrylic mirror to assist in self application. The four compartments contain a different color of pigmented formulations of green, loam, sand and white that will provide protection against visible and near infrared detection. Current camouflage face paints in stick form only provide protection in the visible region of the electromagnetic spectrum. The sticks consist of two cylinders dispensers of grease paint material, each of different colors, joined end-to-end forming one continuous stick. They are furnished in green and loam (Woodland), green and sand (Desert), and white and loam (Arctic). Application of a color is made by pushing the stick through the dispenser from the opposite end. The Force Projection Army of the twenty first century, envisions small, self-sufficient, highly mobile forces that can be rapidly deployed anywhere in the world and be able to operate with little or no resupply for as long as three weeks. If the theater of operations is located in Asia, Africa, Latin America, or other developing countries or geographical areas there will be high casualties due to diseases carried by insects. Such casualties will begin to occur a week or so after the operation is initiated and, depending upon the environment and the condition of the troops, could accumulate to such numbers as to cripple the operation within three weeks if no replacements were available. Insect repellent (NSN 6840-00-753-4963) cannot be used with currently issued camouflage face paint due to the solvent properties of the repellent that causes the paint to run. The proposed combination camouflage face paint insect repellent will replace two items with one, thus saving space, reducing weight of individual survival kit and saving time in dual application. Moreover, it will provide visible indication of application to exposed skin. The camouflage face paint-repellent formulation provides extended protection against insect/arthropod bites and does not interfere with the infrared signature. The proposed camouflage face paint insect repellent formulation is formulated using a patented state-of-the-art technology to trap the active ingredient (N,N-diethyl-3-methylbenzamide) in a delivery mechanism consisting of a polymer matrix on the skin surface. As the polymer matrix breaks down, insect repellent vapors are slowly released at a predetermined rate to repel insects/arthropods. A preliminary laboratory study indicates that the visual and near infrared spectrum were within the acceptable range. The results of laboratory and small scale field study also indicated that this type of camouflage face paint insect repellent combination can provide extended repellence against mosquitoes and other arthropods under field environment.